In my last post, I made Hoisin Glazed Chicken Skewers as She Who Must Be Obeyed wanted Brochettes. As long as I had the Louisiana Grills Smoker fired up and I was doing Brochettes anyway, why not do the vegetables in the smoker? I couldn’t think of a good reason so I did. This method of doing vegetables is so easy that it shouldn’t be so good but it is. I washed four mushrooms and four cherry tomatoes. I cut four one inch squares each of red pepper, yellow pepper, green pepper and onion. 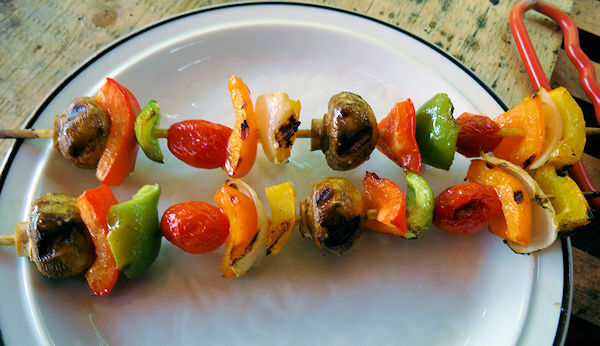 I put the vegetables on two bamboo skewers that had been soaked in water for 30 minutes. I put the skewers in the pellet smoker that had been heated to 350 F for the chicken and brushed the vegetables with Italian salad dressing. I smoked them for 10 minutes, turned and brushed with salad dressing. I smoked for another 10 minutes and then brushed them one last time with salad dressing and served. This is a great side dish because you can adjust it to whatever method of cooking you are using. They can go in a 350 F oven for the same time periods. Or, you could put them on a barbecue grill or under a broiler for 5 minutes, turn and go for another 5 minutes. 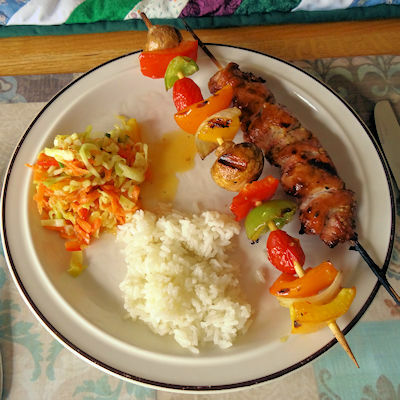 We served them with our Hoisin Glazed Chicken Skewers and deli style coleslaw. These are just so easy it is embarrassing. My advice. Don’t tell anyone how easy they are. Just serve them and take the compliments.